Every little kid loves a song and particularly a song they can jive their tiny limbs to. If they don't, then there's something severely wrong with them and they're likely to end up packing jars of sauerkraut when they're older. And not just for a living, but for a hobby as well. We avoided these vile creatures at our playgroup and spent most of our time dancing the Hokey Cokey. 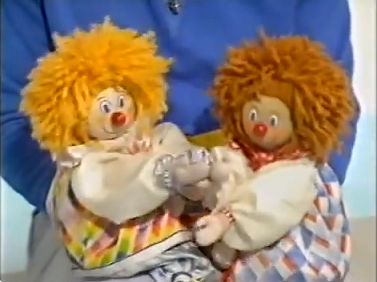 Hokey Cokey, right, it's a show about... well... there's two puppets, ok? Hokey and Cokey. They're operated by Don (Don Spencer) who likes to break into song every 30 seconds or so. He's an Australian too. There's also Chloe (Chloe Ashcroft) who is equally prone to breaking into song. She's English and rocks some amazing 80s jumpsuits. Carol (Carol Chell) also starred and, although we haven't seen any of her footage, we reckon she's up for a song or two. So, these songs, what are they about? Well, they have a strong footing in the realm of nonsense such as "Hooray for Eyes" song and the "Old Woman Tossed Up In a Basket" song. Some episodes have a strong consistent theme e.g. the 'Space' episode, but some episodes seem to be a nonstop jumble of songs, stories and animation e.g. the 'Cameras and Jungle' episode. Another glorious chapter in the history of the See-Saw programming for children on the BBC, Hokey Cokey first aired in October 1983 and consisted of 26x 15 minute installments. 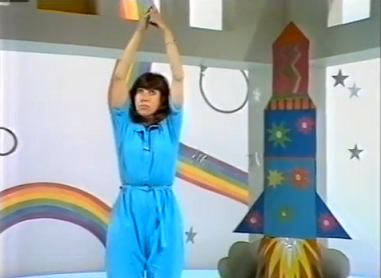 The show was very much a cousin of Play School which starred both Spencer and Ashcroft. Executive producer for Hokey Cokey was Cynthia Felgate who also happened to be part of the crew behind Play Away (a sort of cousin-twice-removed of Hokey Cokey) which also featured Ashcroft. 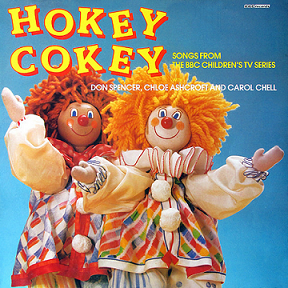 The name Hokey Cokey kicked off a series of nostalgic happenings deep within our brain. The opening credits - some kids mucking about on an estate playground in London - further chimed with our subconscious, but we couldn't remember anything else. YouTube yielded two episodes, so we settled in for half an hour and got our viewing glasses (our eyes) on. The sets are very cheap and point to a shoestring budget which was commonplace for children's television back in the 80s. 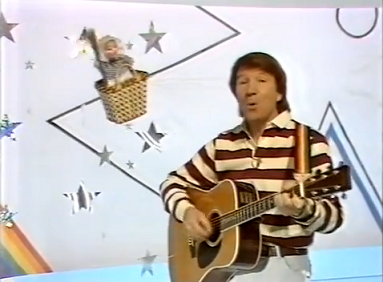 We suspect the Playschool studio was quickly redressed to accommodate Hokey Cokey, but it doesn't really affect the show thanks to the rich and bewildering content taking place up front. Don Spencer is absolutely fantastic in this and his antipodean confidence is a refreshing change from the era's standard avuncular male lead. His persona is an intriguing one as he looks completely comfortable with two frilly clown puppets attached to his arms, but you also wouldn't want to spill his pint of Castlemaine XXXX. A proven musician, Hokey Cokey is the perfect vehicle for Don and he takes it all in his stride. Chloe Ashcroft comes across as a slightly unhinged primary school teacher with her wide eyes and willingness to embrace the songs with a nice line in barmy interpretative dance skills. As mentioned earlier, some episodes seem to be a mash up of ideas and material which point to a particulary strong vein of the avant-garde running through the show. Either that or they were pushed for time. It's an exciting approach though and ensures the show never drags - if you get bored by one section, you know something new will be along in two shakes of a tail. The space episode is more consistent, but no less entertaining with plenty of cutting from scene to scene. And did we mention that there's even some basic chromakey action going on? Check it out in the 'Cameras and Jungle' episode. You'll be amazed that it had reached children's tv at this point. A whole 4 years before Knightmare went psychotic for it. It's difficult to dislike Hokey Cokey as there's such a variety of ideas crammed into 15 minutes on such a tiny budget. The performers help make the show with their supreme confidence and appear very comfortable with material that could easily fluster someone less talented. We'd love to see more episodes and, in particular, some that feature Carol Chell to see how she compares. 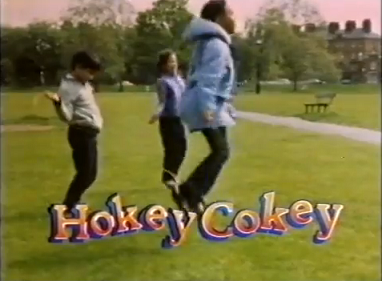 Hokey Cokey, then, is a show which deserves a little more recognition in the pantheon of classic children's TV.